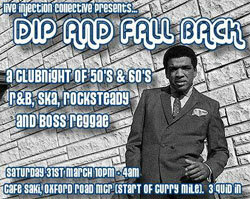 If you’re looking for a night out in Manchester this Saturday, check out Dip and Fall Back, which promises a night of 50s and 60s R&B, ska, rocksteady and boss reggae. It takes place on Saturday 31st March from 10pm until 4am at Cafe Saki, Oxford Road, Manchester (at the start of the Curry Mile). Admission is £3 on the door. For more information, email Dan.